Arctic Flextra is one of ContiTech's unsurpassed hoses in its low temperature lineup. It is a lightweight and uniquely designed rubber hose that can offer exceptional flexibility, durability, and handling capabilities - even at low temperatures. 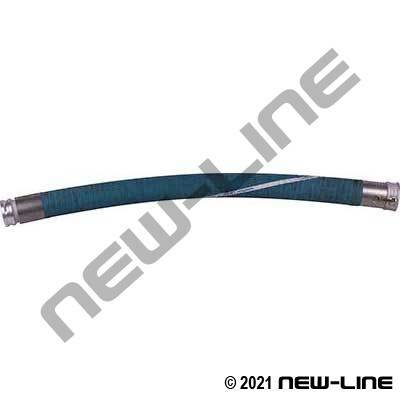 It is suitable for unleaded gasoline/fuels (less than 50% aromatic content), ethanol, diesel, kerosene, hydraulic fluids, hydrocarbons, and Biodiesel (the tube is resistant, but the outside cover is NOT resistant to prolonged exposure to Biodiesel - see the NL3040). It is also resistant to fats, greases, animal/vegetable oils, hot/cold water (not food grade), and certain solvents. Its abrasion resistant cover is built for punishment and it has a unique corrugated design that permits maximum flexibility and smooth movement over rough, surfaces. It also offers a good "force-to-bend" ratio. It is an amazingly flexible yet high pressure hose (150 psi) that has replaced many traditional drop hoses and is one of the most respected drop hoses on the market (NOT designed for reel applications as it has a wire helix). For ordering popular assemblies refer to A3032 part numbers. Typical Fittings: Swage/crimp permanent fittings, camlocks, testing & certification. Note: Corrugated hose exteriors are not recommended for use with internal expansion Scovill fittings; Scovills only recommended for smooth wall hose such as our NL3020 Flexwing. Construction: Tube: Smooth, high quality, black Nitrile rubber. Cover: Corrugated Wingprene (neoprene blend); blue with a white stripe. Reinforcement: 2 plies of polyester cords and 2 wire helix.